Exactly what is biosecurity? It’s one of those words that gets’ thrown around a lot these days, but many people are still unsure exactly what it means. Biosecurity is a set of preventative measures put into place to prevent transmission of diseases/infections to your chickens. In its basic form, it is a set of safeguards to protect you and your flock from external diseases caused by bacteria, viruses, fungi and parasites. If it sounds a bit scary, try to relax and remember that these measures will help to protect your flock (and family). The security needs of backyard flock owners is of course, slightly different from the needs of the poultry industrial giants- most of us don’t have thousands of dollars invested in our birds! However, we still do need to be extremely cautious, especially with the threat of Avian Influenza hanging over us all. We need to protect our monetary investment, our time/effort, breeding programs, food source and of course, for many of us our, affection towards our flock. Today we are going to explain what biosecurity is, how you can practice it without breaking the bank and what it means to you and your flock. 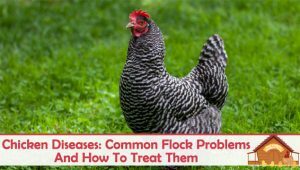 We need to be aware of how disease is spread and what we can do to prevent illness within our flocks. If we do not practice reasonable caution and employ preventative measures, we run the very real risk of losing our birds to a disease. 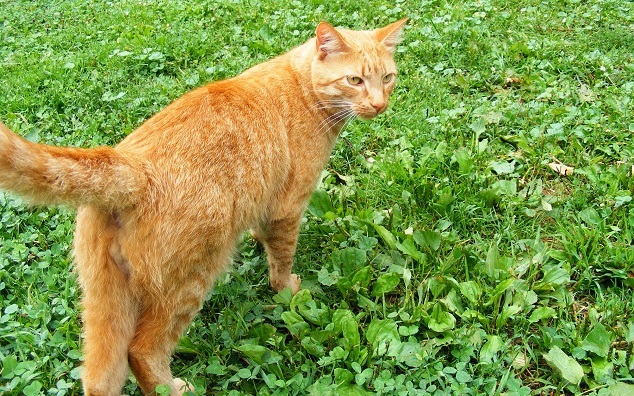 A disease can spread through an animal, insect or human. Mrs Jones visits your flock. She does not change her clothing or shoes before petting your hens. She doesn’t know it yet, but her flock is coming down with avian influenza, contracted from wild birds. She has now potentially contaminated your birds with avian influenza. Your ducks have been swimming in a pond which has recently seen a huge influx in migrating wildfowl. A couple of days later they start to fall ill, they have contracted duck plague (viral enteritis). Rats have set up home under your chicken coop, but you haven’t seen them so you don’t know they are there. They are dropping feces in the food and water sources. Soon your birds become sick and some die. A veterinarian tells you that it’s fowl cholera- caused by rats. As you see, a couple of these scenarios are quite avoidable with a little forethought and planning. You can limit the damage and reduce the risk to your birds significantly. 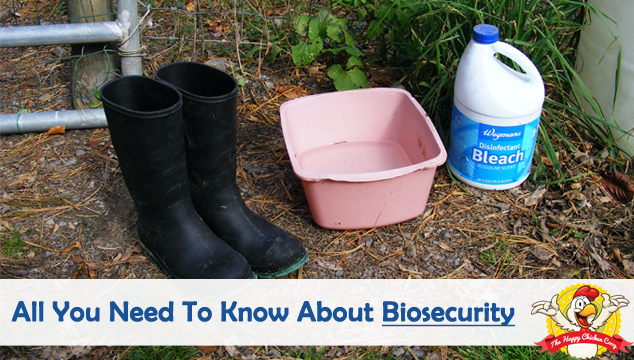 There are three main components to Biosecurity: Isolation, Traffic Control and Sanitation. Sanitizing my shoes before I visit the girls! Keep visitors to a minimum. 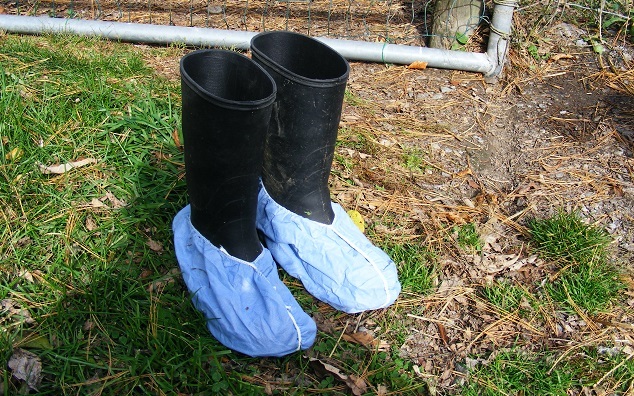 If you do have visitors, make them wear disposable footwear (plastic bags will do). Keep a record of all visitors, new birds, and wild bird sittings. Limit your visits to other poultry farms, markets and auctions. If you feel you must visit other poultry sites, make sure you dispose of these clothes after the visit. Keep one set of boots/clothing for your use with your birds one! 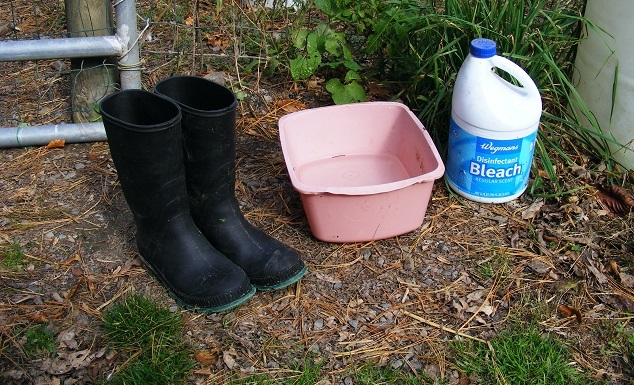 Failing this, use a disinfecting footbath to disinfect your boots after each visit. Don’t borrow equipment from other Poultry/Livestock keepers. Inspect your flock daily and segregated any sick birds immediately. 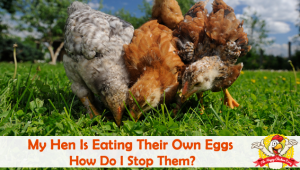 Keep other animals out of the poultry house. Practice a good pest control program (rats, mice, flies etc.) and try to limit exposure of your flock to wild birds. Buy hens only from reputable dealers. Quarantine new birds for a minimum of two weeks- read our blog post on this. Sanitation- keep the coops, equipment, supplies, bedding clean at all times. It looks like a long list doesn’t it? However, I think you will find that you already do many of these things without thinking about them. Try to incorporate all of these things into your routine. Make yourself a checklist that includes things like your regular routine cleaning and maintenance chores. You can do this weekly or monthly, whatever you find convenient. As much as I hate to keep records, I find myself being much more diligent since the arrival of Avian Influenza! Below are a couple of threats that really need to be addressed when keeping biosecurity measures in mind. I am not going to run through AI completely, as we’ve already covered this in another blog post. This is a brief refresher for you since Fall is upon us and a new outbreak is possible at any time. Since the Spring outbreak in the US, more than 43 million birds have been destroyed. Avian influenza is divided into Highly Pathogenic AI and Low Pathogenic AI. The HPAI is the one that concerns us most. It is spread by wild birds- they do not seem to suffer from the disease, especially ducks. They can pass the virus on to domestic birds (chickens, turkeys, ducks) and the results are usually devastating. Birds will start dying rapidly. If this starts happening to your flock you need to contact the USDA immediately by calling: 1-866-536-7593. They will come and swab your birds to identify the cause of the illness and deaths. Your premises will be placed under quarantine until test results are back. If they test positive for HPAI, any remaining birds will be destroyed and your premises sanitized. They do compensate for destroyed birds, but generally only a fraction of what you may have invested. As cruel as that sounds, it really is for the benefit of others flocks, whether commercial or backyard. This is a broad heading for rats, mice, voles, chipmunks etc. She is the perfect rat catcher! Where there is free food, there will be scavengers. Rats and mice seemingly come from nowhere, set up house and soon have a rapidly expanding family! Many times you will not even be aware that you have a problem. The biggest issue with rodents is that they can carry diseases such as salmonellosis, leptospirosis and rat-bite fever. Holes chewed in feed bags. Droppings in feeder or drinker. Holes excavated under your coop. Seeing them scurry away- if you see them during the daylight you likely have a huge problem. My favorite is a great barn cat! These stealthy hunters are very effective in keeping populations down- of course, your cat needs to know that chickens are not on the menu too! Bait stations are another very good option. The bait is contained within a box and only something small can access the box. Note: Be extremely careful with bait stations. 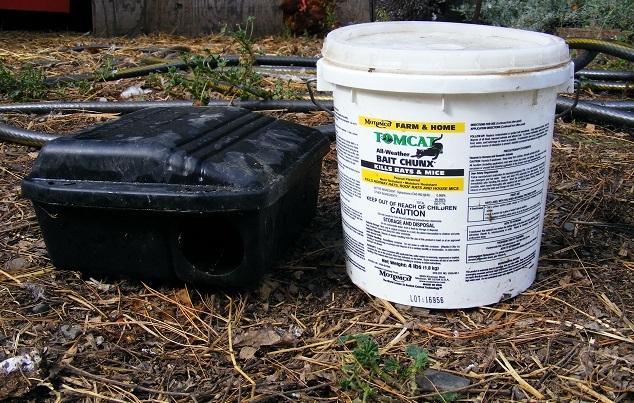 Pets or chickens can become sick if they peck/touch poisoned rodents! Snap Traps are the old fashioned method and are still available in most hardware stores. These can be hazardous to the operator, nosey pets and chickens, so use with caution! Keeping your feed in a sealed container- plastic or metal will ensure that the feed is not contaminated before the birds get to eat it. Clean up around the coop and run every night. Picking up remnants of corn cobs, pumpkin skin, cabbage leaves etc. Check the coop for entrance holes- if you find any, plug them up securely. Finally, don’t leave food outside the coop at night. Flies are the main culprits here. 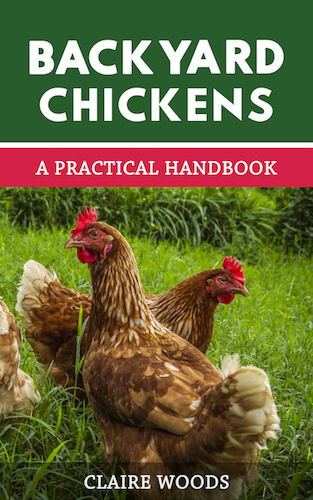 We mentioned these in a previous article: The complete guide to chicken parasites! Blowflies or filth flies as their name implies, love filth, poop and dead things. As you might imagine, this makes them very unsanitary creatures! Fly populations can easily be kept down by frequent removal of poop from the chicken house and hosing the run and yard fairly frequently. Flies have been known to spread tapeworms and cause flystrike in chickens. Flystrike is when the flies lay eggs in the poopy back end of a chicken, causing a maggot infestation that will eat into the skin. As a footnote, mosquitoes are being monitored as a possible vector in AI. In the Northern climate they should not pose a threat this winter. However, if you live in the Southern states, you might want to be more aggressive in eliminating mosquitoes. Remember: humans, vermin and insects are all are capable of transmitting not only bacteria and viruses, but parasites and fungal spores too. We have taken an in-depth look at what biosecurity is and how we can make it work for us- the backyard chicken keeper. As previously noted, you are likely doing many of these things now without thinking about it. It really doesn’t take much time to implement most of these Biosecurity ideas into your current routine. Having a weekly or monthly check sheet is a handy reference guide for you. If you are an established breeder or show your birds, you are likely doing all of these measures and more to keep your flock safe. Make sure to let us know below, what Biosecurity measures you take to keep your flock safe. My Hen Is Eating Their Own Eggs. How Do I Stop Them? Hi, rats now live under the coop. There is hardware cloth buried around the coop/pen area 10″ deep, but they’ve tunnelled under that and moved in under the coop. I’m at a loss as to how to keep food off the floor of the Pen. Chickens throw it around, we couldn’t possibly get it out every night at dusk to keep the rats out. I don’t want to put it in the coop as I feel this would encourage the rats to gnaw their way in. We know they go in during the day to get eggs. Help? For sanitization, what is the recommended ratio of bleach to water? Is 1:10 strong enough?